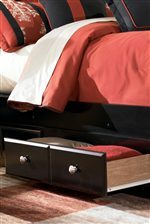 Combine comfort with function with this king poster bed with underbed storage. 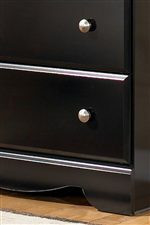 Two drawers underneath with satin nickel colored knobs add extra storage space for blankets and pillows. Four end posts create a stunning look, while the headboard features a wide segmented frame and footboard features a matching design and curved apron. This bed is available in queen and king sizes. The Shay B271 King Poster Bed with Underbed Storage by Signature Design by Ashley at Del Sol Furniture in the Phoenix, Glendale, Tempe, Scottsdale, Avondale, Peoria, Goodyear, Litchfield, Arizona area. Product availability may vary. Contact us for the most current availability on this product. 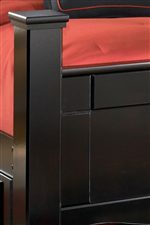 B271-50 Queen/King Bed Storage 1 81" 18" 11"
B271-66 King Poster Footboard 1 81" 6" 33"